An ideal battery stores electrical energy in a way that makes it instantly available at the turn of a switch - with all the energy that has been put into the battery being available for use at any time. The lead-acid battery falls short of this ideal - but in a manageable way. It is the most cost effective battery by a factor of two over alkaline and by a factor of ten over lithium. The lead-acid system is thermodynamically unstable at full state of charge. The active materials in the plates discharge continuously, typically a few percent per month, until the battery is fully discharged. A lead-acid battery that is operated at a low state of charge for a long period of time develops a condition of irreversibility in the negative plates called sulfation. Prevention is simple. Make sure the battery is brought to full state of charge after use. A motive power lead-acid battery is a battery that is repeatedly deep discharged and recharged. It must be given a slight overcharge at the end of every charge for it to achieve 100 percent practical state of charge. This overcharging inevitably causes the positive plate supporting grids to become corroded very slowly, over a number of years. Corrosion initially assists but in the long term interferes with the adhesion of the positive active material to the grid structure and results in shedding of the active material. This leads to capacity loss. Yet if the battery does not regularly receive a mild overcharge, it becomes sulfated and will fail prematurely. Optimum operation of an industrial motive power battery results in deep cycling battery life of about 1500 cycles - about five years. Batteryvitamin is a 21st Century exclusive battery supplement developed by F&H to counteract corrosion, by preventing the lead and antimony metals, that are slowly drawn out of the positive grids by the corrosion process, from reaching the negative plates. 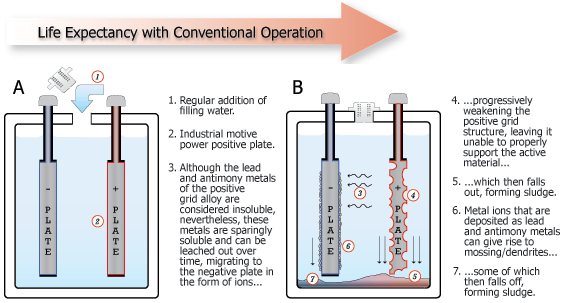 Solubilities of lead and antimony in battery acid are very low, not zero. When these metals are prevented from reaching the negatives, the battery acid quickly gets saturated and the corrosion of the positive grids is held back, (like a crowd gathered at the doors of a theater holding back exiting patrons). This helps to extend motive power battery life by 40%. Batteryvitamin is chemically different, has the same electrochemical effects, has a much stronger long-life action compared to rubber separators. 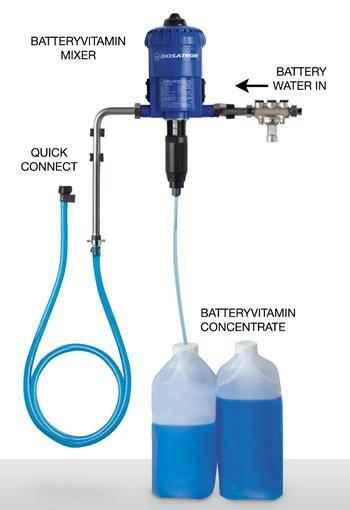 In-use motive power batteries are conveniently dosed via their refill water, using a water pressure powered dosing unit. (Fixed ratio dilution 1:125. Water consumption self-adjusts to battery size and workload. This ensures that batteries consistently receive the optimum Batteryvitamin dosage). The way in which a lead-acid battery works cannot be discussed in terms of chemistry alone. The interactions that occur at the electrode surfaces are governed by the laws of physics. The ends closest to the surface are in adsorption equilibrium, subject to attractive and repulsive electrostatic forces that act between the Batteryvitamin molecules and the surface, meaning there remains a tiny gap, (Reference 1). This allows the battery related chemical reactions to proceed at the surface unimpeded and for the molecules to "ride" over the charging and discharging surface formations. When the battery is being charged and is nearing full state of charge, there is the usual sharp increase in voltage and onset of gassing at 2.35 volts per cell. At about 2.45 volts per cell the free ends of the rod shaped molecules change shape, become effectively broader at their ends, which is shown schematically, resulting in the pathways between the electrolyte and the underlying negative plate becoming very much narrower, (F). The rod shaped molecules are voltage sensitive. The transition is voltage activated. The barrier can operate only when the battery is on charge and is near or at full state of charge. It significantly increases the on-charge negative electrode (plate) potential, resulting in less gassing and a reduction in water consumption. 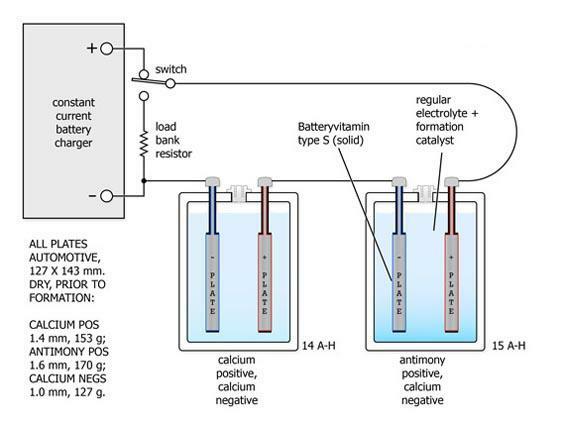 Saturation of the bulk of the battery acid electrolyte with metal ions provides a small reduction in the relative potential of the positive electrode (plate) which can sometimes help reduce charging times. Electrical testing and teardowns confirmed the essential spongy pore texture of the active mass in the negative plates to be unaffected by the low dosage Batteryvitamin substance. PAUNOVIC, M and SCHLESINGER, M. "Fundamentals of Electrochemical Deposition", The Electrochemical Society, Inc., (John Wiley & Sons, New York, 1998), Reference 1, Chapter 10 section 2; Reference 2, Chapter 2 section 8. 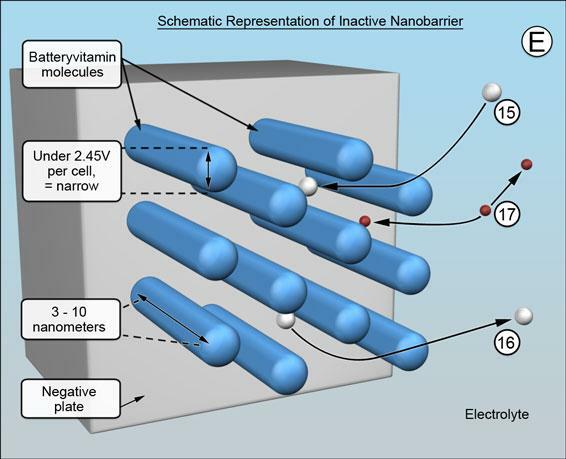 The metal ion barrier can pave the way for thinner positive plates without attendant loss in battery life. 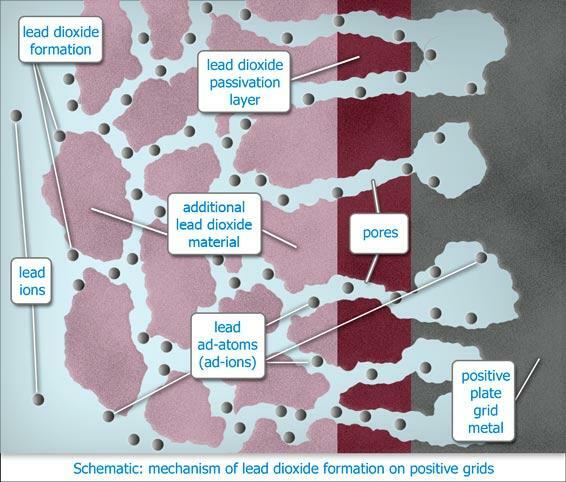 The following is a more detailed explanation of the sequence of electrochemical and physical interactions that began with the formation of the electrochemical barrier over the surfaces of the negative plates - and ends up helping to reduce positive grid corrosion. The working potential required to bring about electroplating of lead is very low, a potential of only 0.1 to 0.5 volts per cell is typically all that is required for the operation of lead electroplating baths of the type used by the electrorefining and electroplating industries. The general principle at work also applies to antimony. In electroplating, metal of a positive electrode is progressively dissolved into a suitable electrolyte and is plated out onto a negative electrode under the influence of an electric current. Battery manufacturers generally do not pay very much attention to electroplating in battery cells. It is true that it is almost imperceptible, however, its long term effects are profound. Since in principle, there is very little that distinguishes electroplating cells from lead-acid battery cells, this would seem to imply that at over 2.0 volts per cell, electroplating should be taking place in every lead-acid battery cell at a veritable hurricane force rate. It is well known that this simply does not happen. It does not happen mainly because the solubility of lead (as well as antimony) in sulfuric battery acid is extremely low. The electric field that is trying to "drag" lead metal away from the surface of the positive plate grids is in no way diminished by this low solubility, however. Electrolysis, (gassing charge), is an essential participant but solvation of the lead is the initiator of corrosion. Corrosion quickly covers the surfaces of the lead conductors and support structures of the positive plates with a protective layer of lead dioxide, Pb02. The layer has semi permeable properties. For batteries used on float duty, the layer is sufficient to further reduce electroplating to an imperceptible level. During overcharging significant amounts of lead metal underlying the lead dioxide layer become partially dissolved, thus able to migrate via the semi permeable layer of lead dioxide, to the surface of the protective layer, whereupon most of the lead becomes fully solvated and converted to lead dioxide which precipitates onto the protective layer. Over time this results in failure of the positive plates through plate growth, grid disintegration and sludging of the active mass. The balance electroplates out onto the negatives, causing mossing and "leading" through, (Pb-ing). The negative plates act as powerful scavengers during overcharging. They extract lead ions from the electrolyte and thereby reduce the already low lead concentration to a very low concentration. This helps the electric field to draw lead away from the conductors and support structures of the positive plates during overcharging. Flat plate pasted positives are especially prone to this effect. In the case of tubular positives, the volume of lead dioxide active material that surrounds the spines helps to attenuate migration of the lead out of the underlying metal spines. 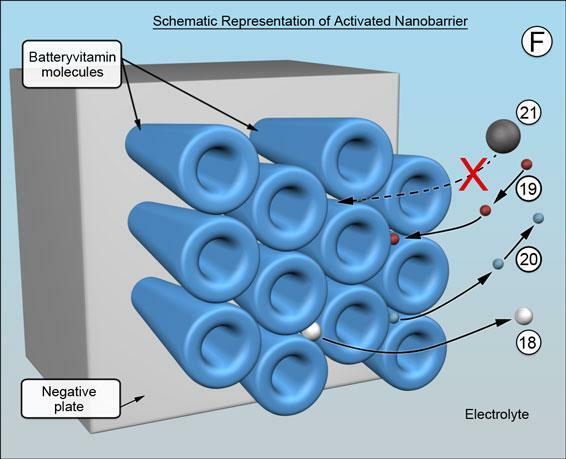 When the metal ion barrier is present, the lead ions that would otherwise have been electroplated onto the negative plates, are no longer able to do so as before. The concentration of lead in the bulk of the electrolyte is able to rise to saturation. Importantly, there is not enough lead to return to the positives to make a difference. The upshot is that the negative plates, which had been behaving as powerful attractors to the lead ions, albeit via a difficult-to-negotiate path, would no longer be able to exert their previous influence. This would be followed by a steep decrease in the rate of dissolution of the structural lead and a corresponding reduction in the precipitation of lead dioxide. In a nutshell, regulation of a few ions that are flowing via a difficult-to-negotiate path and subject to a powerful electric field provides control over the flow of numerous partially dissolved ions that are following an easy-to-negotiate route. This amounts to a form of amplification. The ions can include lead, antimony, tin, etc. The benefits can be very significant. The rate of corrosion during moderate overcharging can be brought in line with float duty corrosion. The severe corrosion that accompanies excessive overcharging is unlikely to result in premature failure of the battery. The onset of positive plate growth and sludging can be delayed. The unusual combination of materials and interactions appears to have contributed to the metal ion barrier having been long overlooked in the context of lead-acid batteries. This is not about a theory but a technology that has undergone field trials. It is about extensive Faraday-style investigative experimentation that positively identified the mechanism at work and helped to develop the best materials for the job. It has taken the convergence of knowhow in such diverse fields as battery and electroplating technology, plus semiconductor experience, against a background of physics to recognize what it is, what it can do and how to harness it. More than half a century ago when lead-acid battery manufacturers switched from wood veneer separators to synthetic materials, the changeover inadvertently caused battery life to crash. The solution was found in the use of ligno-sulfonates and, in the USA in particular, in the use of rubber separators. Other than empirically re-formulating these substances, it seems hardly any investment has been made in the utilization of organic materials to purposefully continue to enhance battery performance. Batteryvitamin is designed to put organic technology back in the running so as to better equip the lead-acid battery industry to meet the inevitable difficult commercial challenges that lie ahead. Our ongoing R & D has produced a solid version that is a functional equivalent to liquid Batteryvitamin - for building into batteries - giving manufacturers who are able to use it a significant advantage in the market place. Batteryvitamin S2, (solid), can help to achieve calcium-like low water consumption from antimony alloy batteries - but to do so a formation catalyst in the electrolyte has to be used. New antimony alloy positives give off a surge of antimony during formation that is deposited immediately on the negatives, causing the characteristic high water consumption of antimony alloy batteries. This is likely to be masked if the negatives also contain antimony in the grids but shows up clearly with calcium alloy negatives. The catalyst has a half-life roughly equal to the duration of the formation charge - disappearing without a trace after only a few days. The advantage of Batteryvitamin S2 plus formation catalyst are obvious. The use of recycled lead carrying a large impurity burden is facilitated. Batteries can be provided with long lasting antimony alloy positives and low water consuming calcium alloy negatives - resulting in the best of both worlds in service. For example, the way would be cleared for industrial motive power batteries and golf cart batteries to be watered no more than once a year (!). Hybrid and electric automobile batteries could be made very inexpensively, yet provide a highly satisfactory battery life. The following diagrams provide details of the test procedure. 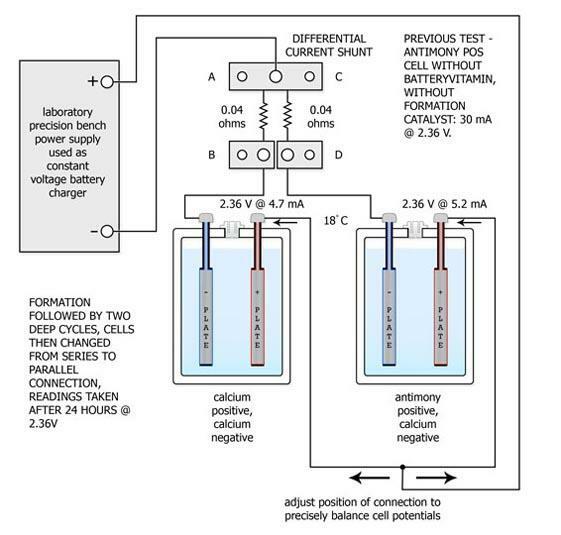 The two cells received formation charging connected in series and were subsequently deep cycled twice to ascertain their ampere-hour capacities. The antimony positive cell appeared to have about 7% more capacity than the calcium positive cell - likely due to its positive plate being fractionally thicker. The antimony's end-of-charge dV/dt had been considerably speeded up and more sharply defined. The cells were reconnected as shown above and the potentials across both cells were carefully adjusted to match each other using a high resolution Hewlett-Packard digital voltmeter. The currents via the cells were measured with a specially constructed differential shunt resistor network having a matching accuracy batter than 0.1% . The current of the Ca-Ca cell was measured across A - B, the current of the Sb-Ca cell was measured across C - D and the differential was monitored across B - D, again using the H-P instrument. Subsequent cycling of the cells in parallel was performed. Discharging at the 5 hour rate down to 1.50 V/cell and charging at the 20 hour rate up to an average of 2.60 V/cell - holding this voltage for 5 hours and then lowering it to 2.36 V/cell for 24 hours to measure the electrolysis current. After 10 cycles the electrolysis current of the Ca-Ca cell had fallen from 4.7 mA down 1.8 mA, while that of the Sb-Ca cell had remained at 5.2 mA. While implying an improvement in the Ca-Ca cell, individual cell capacity testing showed the Ca-Ca cell capacity had fallen from 14 A-H to 5 A-H, while the Sb-Ca cell capacity had risen slightly from 15 A-H to 17 A-H. The positive plate of the Ca-Ca cell was replaced with an identical freshly formed and precycled plate, resulting in the electrolysis current rising to 4.6 mA and the capacity being restored to 14 A-H.
Had the Ca-Ca cell been defective? To find out, two more Ca-Ca cells were built, formed and tested in the same way. Both suffered similar capacity loss. Indeed, numerous publications have described this kind of capacity loss and therefore it must be accepted that lead-calcium alloy technology might well prove to be an evolutionary dead-end. Investigations by the then-called Bell Laboratories, Murray Hill, New Jersey, in the late 1960s and 1970s, demonstrated that post-1950 lead-calcium grid alloy batteries had been overpromoted and had consistently failed to meet user warranty expectations, failing well short of the industry-standard 20 year float-duty life expectancy. Scientists at the Bell Laboratories have been awarded 13 Nobel Prizes. It can be safely assumed they know what they are talking about. Frustratingly, the problems with lead-calcium have not been satisfactorily overcome, right up to the present. Since treatment assists in increasing battery life, the upsurge in water consumption at the end of the useful service life of a motive power battery is delayed. In this context battery leasing, once a year maintenance, at a fixed price - no watering hassles in between - seems to look set to become a reality. The previous test showing the advantages of Batteryvitamin S2 in automotive battery application was repeated using motive power battery components and a substantial amount of carbon additive, plus Batteryvitamin S2. A high concentration of carbon in the negative active material can enhance battery performance significantly, although the relatively low hydrogen overpotential of this material can lead to excessive gassing. The test shows this nuisance can not only be entirely eliminated, the end-of-charge current of the treated cell can be reduced by a factor of four compared to a conventional cell by the use of Batteryvitamin S2. The test plates were obtained by disassembling a 6 volt, 150 ampere-hour golf-cart battery that had not yet been formed. The plates were cut down to the required size. The procedure has been used for many years and can provide excellent quality plates down to one or two ampere-hour capacity. The negative active material was removed from the grids and ground to a fine powder. This powder was then mixed with 2 percent by weight of activated carbon powder and 1 percent by weight of Batteryvitamin S2. The mixture received a small quantity of dilute sulphuric acid, sufficient to produce a paste of the requisite consistency. This paste was pressed, while still hot from the acid reaction, into suitably sized metal grid sections. The plates were cured and the active material appeared to be mechanically similar to the active material of the plates that had been sacrificed. The cells were assembled and formed. The treated cells provided an initial rate of gassing following formation that was disappointing. After two deep cycles the end-of-charge rate of gassing fell dramatically - measuring a quarter of the untreated cell after ten cycles. Battery purists might feel uncomfortable with the plate making technique yet the deep cycling runs confirmed the ampere-hour capacities of the test cells closely matched each other and closely matched the original negative plate cell capacity. The two-plate construction provides a simple, accurate and efficient test bed, although the internal impedance of the cells is likely to be sub-optimal. This disadvantage is negated by comparing like with like. 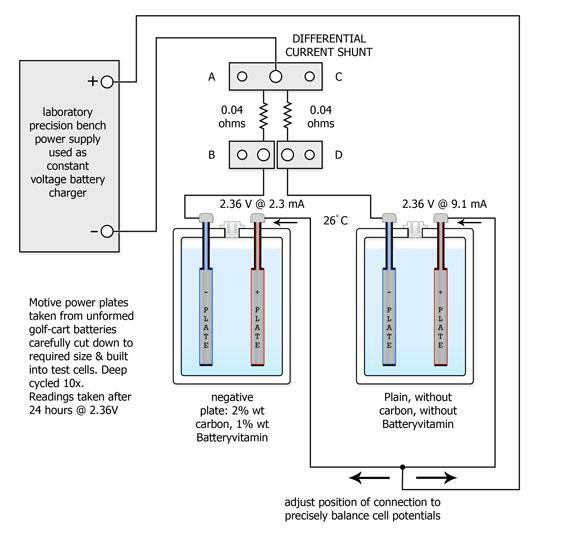 The treated cell exhibited a vastly superior voltage stability compared to the untreated cell when subjected to 2C, 5C and 10C discharge and charge surges. Experiments of this type apply the scale-it-down and speed-it-up research technique used by bridge builders and ship builders to lead-acid technology. They are easy to repeat and therefore easy to verify. This experiment has shown that the beneficial properties of carbon and of Batteryvitamin can be combined, implying that this combination can help to pave the way to a new era of super batteries. Batteryvitamin L, (liquid), Batteryvitamin S1, (liquid) and Batteryvitamin S2, (solid) provide exactly the same function in lead-acid batteries, although chemically distinct from each other. 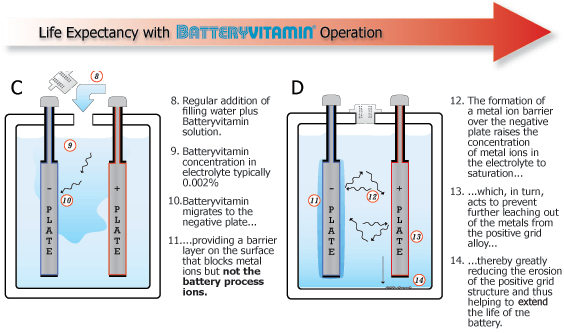 Batteryvitamin L is soluble and goes to work via the battery filling water and the electrolyte. Batteryvitamin S1 is soluble and is suitable for incorporation into PVC and PE battery separators. Batteryvitamin S2, is insoluble and is incorporated into the negative active material during manufacture. Ongoing research has shown Batteryvitamin has many more qualities or facets than the one that extends battery life. Take for example improvements in maintenance-free and thin-plate technology, optimization of automotive and opportunity charged batteries, reducing water consumption and administering water treatment. The underlying mechanism is always the same, yet the benefits can be wide and varied. What Batteryvitamin does inside the battery helps to overcome major battery shortcomings. This can offer battery manufacturers a direct route to improving battery performance and assuring customer satisfaction. Batteryvitamin L has been in use for over a decade on tens of thousands of motive power batteries. Batteryvitamin S1 and S2 availability and use are subject to terms and conditions.